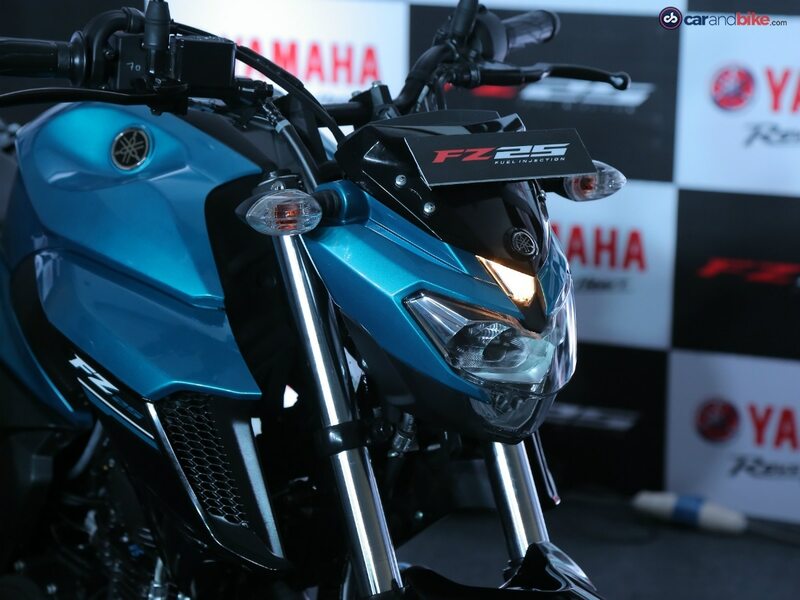 The FZ25 is designed to emphasise a mass forward layout and downforce, evoking the powerful muscles of an athlete. The model comes equipped with a reliable single-cylinder engine proven on sport bikes for the Japanese market, which has been fine-tuned and optimised for Nepal's traffic conditions such as with improved intake/exhaust and ignition systems. The engine has been developed in line with Yamaha's New Generation Engine Development Ideal - 'Blue Core' - to improve overall performance including fuel efficiency, acceleration and environmental friendliness. The model is compliant with BS IV emission standards. .
With its maximum power output of 20.9 PS at 8,000 rpm and maximum torque of 20 Nm at 6,000 rpm, the 249 cc, 4-stroke, SOHC, 2-valve, single-cylinder and high-torque fuel-injected engine in a lightweight 148-kg frame establishes the FZ25 as a powerful ‘mid-class Street Fighter'. . The new model comes with a sharp, sporty LED headlight and taillight, an LCD instrument cluster which includes a trip meter as well as a live fuel economy indicator, tubeless tires made with a specially formulated compound for lightweight wheels, a mudguard that moves with the swing arm, wheels with a spoke design, racing-style footpads for the rear seat and a superb suspension for enhanced comfort. The suspension setup includes telescopic forks in front and monoshock at the back. FZ25 comes with 282-mm front and 220-mm rear disc brakes and is targeted at biking enthusiasts in their 20s to mid-30s. .
Deepak Rouniyar, AGM-Sales, Yamaha - MAW Enterprises said, “While the bike has been engineered for new age biking enthusiasts, its superior design and comfort makes it perfect for daily use as well.” The FZ25 is available in three colour schemes - Ballistic Blue, Warrior White and Knight Black and is priced at Rs 3,44,900.. Meanwhile, MAW Enterprises have announced a test ride contest where customers who try out the new Yamaha FZ25 could win a brand new MacBook. This contest is open for a limited period of time.